PRICE REDUCTION and BEST LOCATION on 15th green and 16th tee with the entire house designed for optimum views of the course and the mountains. 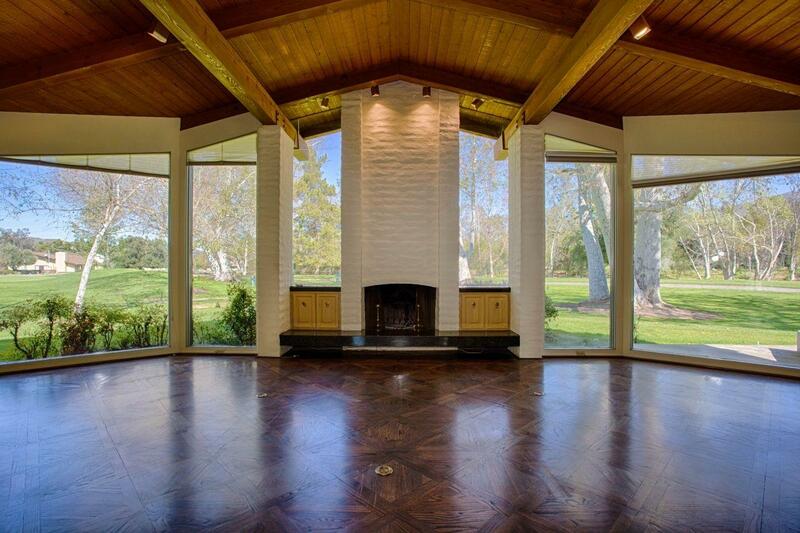 Built by one of the most respected Orange Co. builders John Lyttle for his personal residence. 3 bedrooms/4 baths with an attached guest suite including mini kitchen within. 2 master suites. Great room area has open beam vaulted ceilings and vintage solid wood flooring. flowing right into the kitchen family room. Needs updating and a roof but so worth it. 7 skylights keeps it bright without sacrificing storage areas. Many extras found only in a custom built home like this. Beautiful wood paneled bar with a custom designed glass door. The 2 bedroom/2 bath master has 3 walk-in closets. One bath has a tub and the other an oversized shower. Guest suite has its own outside entrance and a small kitchen. Off the kitchen is a family room complete with a fireplace and built-in bookshelves. Kitchen has an island with cooktop, prep sink, butcher block counter and lots of storage. Huge walk-in pantry. Adjacent optional bedroom was used as an office and has even more bookcases. Large laundry room with outside entrance. Security system and total house intercom installed. 2 separate garages, 1 double and 1 single. Behind the single is a 6X8 workshop for the handyman. Across the street from the community pool and open common area. The Pauma Valley CC is a private golf club with dining, fitness, tennis, pool, rental casitas and a private airport. Memberships are available with a vetting process. Listing provided courtesy of Curtis Coleman Company. Listing information © 2019 San Diego MLS, Inc.